Looking for Shelving and Storage Installers in Brookline Village, MA? J. Mota Services has been installing shelving and storage systems in Brookline Village, MA, and the surrounding area since 2007. They have assembled and installed flexible and permanent, modular shelving and space-saving storage systems in many Brookline Village homes. J. Mota Services has the experience, tools and knowledge to install towel rails, coat racks, shelving and storage hooks in your Brookline Village garage, basement or pantry. J. Mota Services has been installing shelves and storage units in the Brookline Village for well over 12 years. They have installed shelves in Brookline Village Massachusetts for heavy loads, wall-mounted shelves, and those that are easy-to assemble, disassemble and even reassemble. J. Mota Services can eliminate all the hassle of having to perform the job yourself, and have your units up and functional in your Brookline Village home or office in no time. 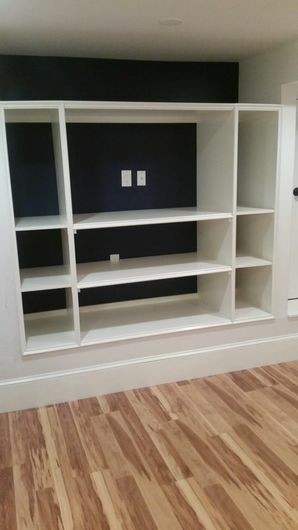 When it comes time to design, assemble, construct, or install shelving or storage systems in Brookline Village, J. Mota Services can provide all the skill and manpower required. If you have ever had the experience of assembling shelves or storage systems, using "easy-to-follow" directions, you quickly realize it can be a daunting task. J. Mota Services has all the tools and the experienced Brookline Village personnel to install shelving easily. For the last 12 years, J. Mota Services has offered storage installation services to Brookline Village residents. Call (781) 281-9282 to learn more about J. Mota Services's Brookline Village storage and shelving installation services.